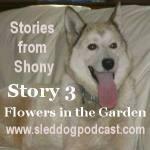 Shony tells us about a new dog in the kennel and how her air of discontent permeates the kennel like weeds in a garden. Listen to her third story and discover how to be a flower in the garden instead of a weed. As you listen, learn also about kennel life for a sled dog. Help Support the Sled Dog Podcast. If you ever shop Amazon, use this link. It will help us and you still get the same deals from Amazon. Thank you from all of us at the Sled Dog Podcast. If you would like to receive each episode, click on the iTunes feed above and you will automatically be subscribed to the Free Podcast. Thank you.